This past week we were very fortunate to have Kathleen Ferenz, Apple PD Consultant, visit YIS for two days of department-based professional development. I had heard rave reviews about Kathleen’s work at SAS, HKIS, ISB and WAB, so I was super excited to see what she could offer us here at YIS. I asked Kathleen to follow what I call a labsite format (she refers to it as Japanese Lesson Study). Basically, this means that Kathleen works with a specific teacher in a department to design a lesson that they will co-teach together. The entire department then discusses and works through the lesson in a pre-meeting, watches and participates with students when Kathleen and the department teacher deliver the lesson, and then reflects on the process in a post-meeting. I saw this format regularly at ISB with the equally amazing Maggie Moon (Literacy Coach extraordinaire) and was really hoping it would go over well at YIS too. Each labsite lesson was structured so that the entire department could attend (thanks to our MS Principal for the heroic work of arranging internal(!) cover for all of those departments) all three sessions, back-to-back. This way the team not only had a chance to learn a new technology skill that could enhance their subject-area teaching, but they also had time to practice together, to reflect together, and to brainstorm together. It sounds simple, but how often do entire departments spend a few hours just talking about how to improve teaching and learning at a very practical and hands on level? By far, the best part of this kind of PD is learning with students, in the classroom, at school, with the entire department collaborating together. So much of teacher professional development happens without students around (PD Days, anyone?). Why? The best learning comes from seeing new ideas in action. This is what the labsite format is all about. Each PD session centered around an actual lesson (with all of the department members participating) allowing all of the teachers to actually see the new techniques, strategies and skills put into practice immediately. Kathleen also specifically designed the lessons so that the students could demonstrate mastery and finish the assigned task within the 55-minute lesson (this has some limitations, which I’ll point out later). Watching Kathleen interact with the students, and seeing how quickly they were able to pick up the skills and processes the teachers learned only a few minutes ago was (I think) one of the highlights of the sessions. It’s always fun to see how much faster students can master sequences of tasks than their teachers usually do. Each lesson was designed so that students worked in small groups with a teacher, so just having time to sit, work and learn with students was a blast. At first teachers were concerned that it would be strange to have 8 – 10 teachers in a classroom with under 20 students, but it was so natural and fun. 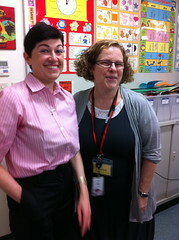 Once Kathleen and the reason so many teachers were in the room was introduced, the students were keen to participate and collaborate with all of us. To me, it seemed like most of the students enjoyed it just as much as the teachers. Kathleen structured post-meeting session to be a reflection of the lesson. Some simple requests for feedback initiated some very valuable discussion about how each department can use or modify the strategies that Kathleen modeled during the in-class lesson. Although the focus was specifically on de-briefing the classroom visit, it became an avenue for further collaboration and cooperation within the departments. I can definitely imagine doing something similar to this at the beginning of next school year to promote a focused and practical approach to learning together – both within and among departments. In addition to the department-based meetings, I also asked Kathleen to run two separate sessions for middle and high school homeroom teachers (we call them tutors). Basically, these sessions were to help tutors think about ways that our Connected Learning Community initiative (beginning next school year) could impact classroom management, student behavior, and productivity. She shared a number of tips and strategies for managing the 1:1 classroom as well as some useful tools and widgets for students. Although this was the first meeting like this that we’ve had all year, personally, I really like the idea of division tutors meeting together to talk about student learning. We all have an added responsibility (above classroom teaching) to help our students stay organized, manage their course-load, and become well-rounded community members. Many of the aspects of a tutor’s job that are second nature now (helping students organize their agenda, clean out their locker, meet deadlines, manage their portfolios) will become digital in the next school year, as we move into a new technology environment. Helping teachers feel a sense of confidence and understanding of how to operate in this new environment feels really important to me. I think these sessions at least got us started thinking about ways to make the transition. From my perspective as a classroom teacher, it is exactly the type of PD that we should be doing: practical and hands-on. The presenter’s physical use of the laptops as a learning tool within the classroom was quite innovative, I thought. I’m excited to implement collaborative tools within classrooms, as I think they are the primary change that we need to implement. Working within the department on subject specific tools was great. Working with the students reinforced our learning, and gave it context. The outcome was great. Kids really and benefited from this. Achieved my goals quickly and in an interesting way, at the same time learning valuable new skills and I leanred to appreciate a different approach and opened up new possibilities and options. Good basis for further development. I learned some useful shortcuts and techniques for myself but above all, the importance of using the laptops positively in the classroom, rather than seeing them as negatively ‘interfering’ with attention span, collaborative ability, etc. Some examples of this: laptops used as physical indicators of the students’ focus and attention (e.g. 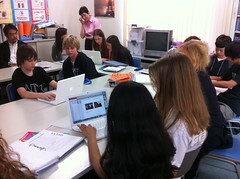 using the lowering of the laptop screen as a signal that they are ready and listening), students working in pairs or small groups with one laptop between them to encourage collaborative learning, sharing of work with other pairs and groups by physically exchanging laptops, not just remote collaboration through a Google doc for example (which is also useful but good to consider other options as well). The content was convincing enough for me to understand the significance of introducing 1:1 to my classes. Overall, I think it went really well. But, of course, there were a few things that I’d like to focus on adapting when we run this kind of PD again. One of the biggest challenges for us was time. Because Kathleen had only two days with us, I asked departments to select classes that met for only one period (55 minutes). Since Kathleen wanted to ensure that the students could demonstrate master and actually finish something during that timeframe, the lessons naturally tended to be focused on the bottom section of Bloom’s Taxonomy. Math students designed flash-cards based on their math notebooks (taking pictures with PhotoBooth, embedding them in Keynote with descriptions and then exporting as pictures), Modern Language students created “talking worksheets” with PhotoBooth, Pages and custom backgrounds based on unit vocabulary, Humanities students developed review worksheets for their current unit on rivers using pre-selected images and organized categories, and English students reviewed important literary devices through the use of shortcuts in Pages and Keynote flashcards. On the one hand, working with departments was great. We can focus on skills and techniques relevant to the content, teachers already know each other well and work together regularly and it allows us to get very specific. However, there are very few opportunities to teachers to collaborate on a deeper level in mixed-department groups, especially across disciplines. I’m sure teachers in the math department would enjoy (and benefit from) working with teachers in the English department (and vice versa). If we could find a way to promote this cross-department collaboration, as well as continue department-based learning, we could have the best of both worlds! As much as I love how effected the outside voice can be (and I will never downplay the importance of external consultants), I think it would be fantastic to develop a culture of peer-led professional development. I know every teacher at YIS is doing something fantastic in their classroom that others could benefit from – even if it’s something they think is small or insignificant because their so used to doing it. If we can find a way to tap into each individuals expertise to develop a culture of cross-department, cross-division (maybe?) labsite rotations, we could get the depth of learning we are looking for, and something that is very specific and tailored to our school community. It’s the end of the year. After a relatively crazy last few months. During exams. Yep, not the best time to run 2 days of intensive PD with internal cover (some teachers were covering for others, then running up to a pre-labsite meeting, then co-teaching, then post-labsite, and then straight back to the classroom – talk about an insane day). We won’t be doing something like this at the same time of the year again, if we can help it. 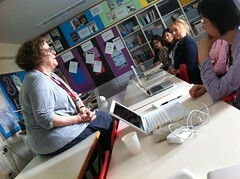 I’m so glad we had the opportunity to implement a labsite-style professional development sessions here at YIS. I feel strongly that this is the absolute best model for in-school PD that I’ve seen – ensuring that learning is happening as close to the classroom as possible. For next year, I’m thinking we could combine the peer-led labsite idea with speedgeeking to kick off the year and to help create “lighthouses” or teacher leaders (or whatever you want to call them) within the school. We could focus on technology to mesh with the Connected Learning Community initiative, but easily move it over to other areas of pedagogy from differentiation to higher order thinking skills to project based learning to MYP (we’re in year 1 of our implementation). As we build a culture of sharing and collaboration across departments and divisions, we can continue to bring in outside experts (lest we become too insular. Here in the island-nation of Japan? Never!) for external inspiration, to help get an understanding of what’s happening at other international schools and to push us beyond our internal capacity. We can make this model our own PD with a purpose. Have you found the labsite/lesson study style of PD useful at your school? Any thoughts/ideas/suggestions for how we can move forward? Informative. We’re moving to a 1:1 environment next year and pd will be so important. I like your idea of a combined speedgeek and labsite lesson activity. Thanks. Thanks for posting such detailed story of what happened. Good stuff. As I read it though, I think “Kim knows all this stuff on her own.” How important is it to have an outside consultant? Is the fact that she is an “expert from afar” the reason people listen to her more than they would an internal candidate? Yes, definitely, the “outside voice” can be very effective (I’ve been on both sides, and it’s easy to see how it works). One thing is the excitement you can build by bringing someone else in from the outside – it’s an “excuse” to have a big event and get everyone enthusiastic. Another is that teachers can see that the ideas that are regularly shared at school are valid, and similar to what’s happening in other schools. Finally, there is always something to learn and I love watching others deliver PD too – even if I know the content, I might not have tried this delivery method. Thanks Kim! Your work in supporting all of us was instrumental. This was very insightful I really enjoyed reading your blogs. As a new teacher Im always looking for new ideas and thoughts. Great! So glad it was useful for you! Hi I am a student at South Alabama in the EDM310 class with Dr.Strange. I just wanted to say how much I enjoy reading your blog and it helps me better understand more of how I should be writing. Thanks!